This article explains how to create a copy of the product or content catalog. For example, you may want to create a second store taking the existing as a starting point, or you may want to have a new country version of the existing e-shop. You can use this solution for creating a custom data exporter as well. These recommendations are useful for the case when the website you want to use as a template was manually changed by administrators since it was launched. In this case, the set of IMPEX files with the initial setup are no longer relevant, and you need to create a new set of the live system. There is an out-of-the-box exporter, but unfortunately it is not flexible in terms of configurability and extensibility. For example, I can’t specify the catalog version for the objects to export. Some object properties are exported separately from the objects they belong to. For example, OOTB Product export doesn’t include product supercategories as part of Product. This information is exported as part of CategoryProductRelation type. 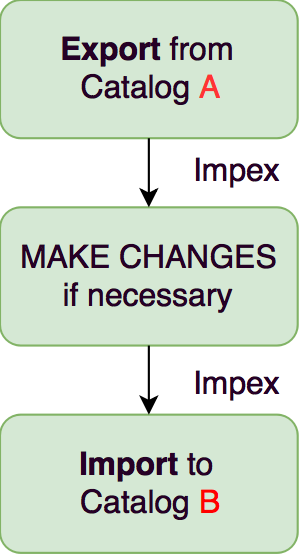 The right Impex includes the relations closer to the object it refers to. For particular use cases it is more convenient than the out of the box approach. However, it creates a complexity as well: we need to process N:N relations. In the current PoC, I blacklist some attributes of some types to avoid mutual referencing for N:N relations. It is not a nice workaround, but it is enough for PoC. Of course, in the PoC, for the sake of simplicity, there are other drawbacks too and points to improve in the next versions including this one. Once we discuss object cloning, there is a dedicated tool as well for this purpose. Hybris 6.4.0 introduced a new CMS Cloning Strategy that enables us to clone CMS pages. It is well documented. However, today we are talking about the catalog aware objects in general, both product and content data. The approach below demonstrates how to address the problem for the out-of-the-box storefronts, both for product and content catalogs. 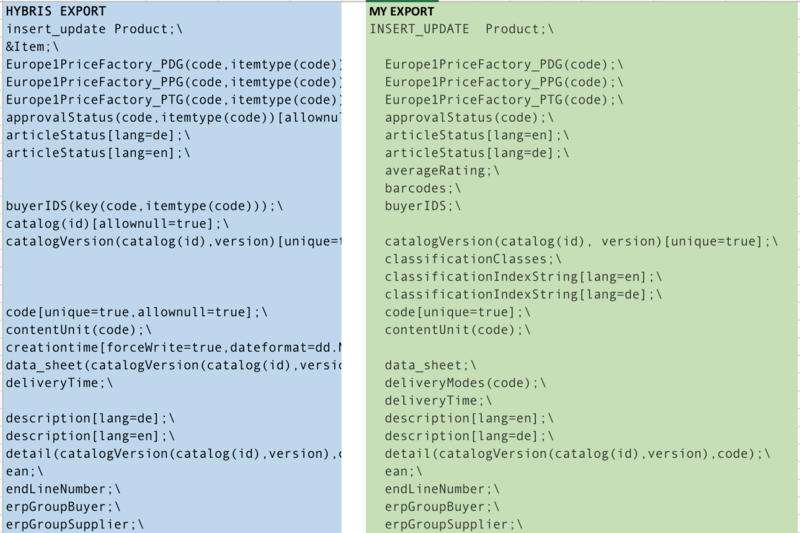 In order to create a copy of the catalog, we need to clone all catalog items with all attributes. In the solution explained below, I export the items into IMPEX, and import them back in the new catalog. The same approach is used in out-of-the-box impex script generator. However, there is a complication: external links, relations. Some external links need to be rewritten: for the cloned copy the objects they link to are also cloned. For example, you may want not to clone media objects. It is useful if media is designed to be shared between the catalogs. The key point here is simple: we don’t know what cloning logic should be applied for the particular reference. For example, you have a product linked to a category. If you create a cloning copy of the product should you preserve the link to a category or use a new item of Category created as part of cloning process? It means so you need to configure per type and attribute whether you want the objects to be referenced (shallow copy) or to be cloned too (deep copy). The good point here is that these rules have already defined in the catalog synchronization configuration for the existing types and attributes. So my goal is to create an IMPEX file for all these types taking into account the synchronization configuration with some flavors of manual tuning. If it says that the object needs to be cloned, I am going to resolve the link into a set of external symbolic keys, such as UID or CODE. If the configuration says that the object needs to be referenced, I will use a PK instead. Why IMPEXes? Because it will help me to split the process into two separated phases: exporting and importing. I will be able to change the data in the middle. I can extract the data from one environment and apply the impexes to another environment. At least, I can use this information as a backup of the catalog-aware objects. Some objects don’t need to be copied. It is very specific for the task, though. For example, PriceRow and Media are catalog-aware, but creating copies of all medias might not be part of your task because it is a resource-intensive process. So we need to mark such objects as “referenced”. Many types are subtypes of one or more supertypes. The object of the subtype belongs to the supertype as well, so we need to take it into account to avoid doing the work twice. For example, there are objects of the Product type, and objects of the ApparelSizeVariantProduct which is a subtype of Product. We need to split attributes into language-dependent (localizable) and language-independent. For the sake of clarity, each group can be additionally split into two categories: values and references. “Script 3” For each of the categories above, generate an Impex script for exporting. Create a cronjob with this impex file. “Script 4” Replace the catalogVersion with the target one. 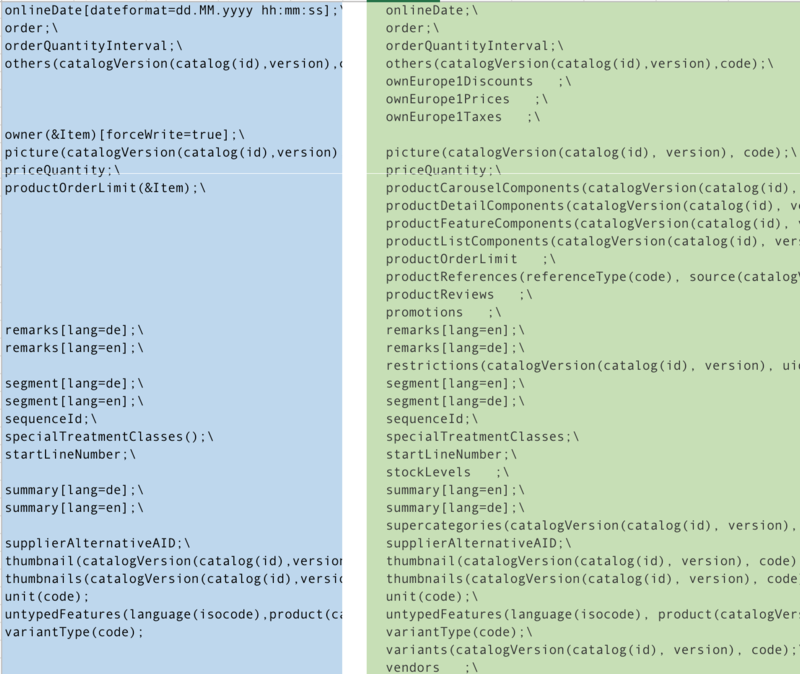 In order to get the copy of the existing data, we need to replace the catalog name with the target (new) catalog name. The first task we need to address is identifying the catalog-aware hybris types. We need to clone items in them. For example, if you clone a content catalog, all pages, page slots, and components need to be cloned. As you see, some types may be catalog-aware while their parent types are not and vice versa. in the output. 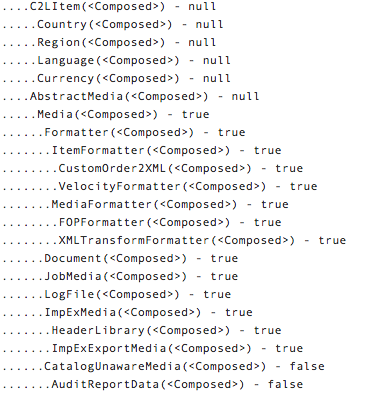 For SAP hybris 6.6 OOTB, the final list of such objects has 177 objects. Possibly you need to reduce a number of types to export, because there are a lot of them that are not very important for the process or empty. However, you need to remember that excluding Media won’t create the clones of the images, and you need to configure the exporting or importing modules to process the external references to images correctly. For example, ProductX from CatalogA has an image Y from CatalogA. After creating a copy of ProductX in CatalogB, the system will expect that the ImageY is also copied. If you exclude Media from the list of the types, the image won’t be created and the IMPEX file will have an issue. Possibly, you will need to fix it manually or automatically by processing image types with some custom rules. Let’s create a list of attributes for IMPEX for the types created at the previous step. The output of this script will be used as input for the IMPEX statements generator. The script is written in Groovy, so you can execute it in HAC, without installing any additional software. For each type from the list, it finds the exportable attributes, and creates parameters for columns in the impex, such as (catalog(id), version). You can see the block with the 0s and 1s in the screenshot above: these digits are the attribute flags, such as unique attribute, mandatory attribute or relation type flag. So I decided to slightly change the output format: this script creates the semicolon-delimited values enclosed in quotes followed by a comma to use this block as a constant array (“lines”). This script is relatively simple. It transforms the data from the previous step into the instructions for hybris what types and attributes should be exported. This scripts above are designed to work only with one catalog at a time. That means you need to repeat the steps separately for Product and Content catalogs. Classification catalog is also a catalog you may want to copy, but the attribute for it has a different name, systemCatalog. Currently, the scripts are not designed to process the classification catalogs. It is easy to add this feature though. Some attributes are excluded because they have special purpose. They are listed in the scripts. Possibly, for you set of attributes you need to exclude more. Some attributes are in conflict with each other. For example, Object A refers to ObjectB while ObjectB refers to ObjectsA as well. Hybris can handle it via lean imports, but in some cases it doesn’t work nicely. For example, the attribute contentSlots for the page objects was excluded because of the ContentSlots are defined via contentSlot objects. 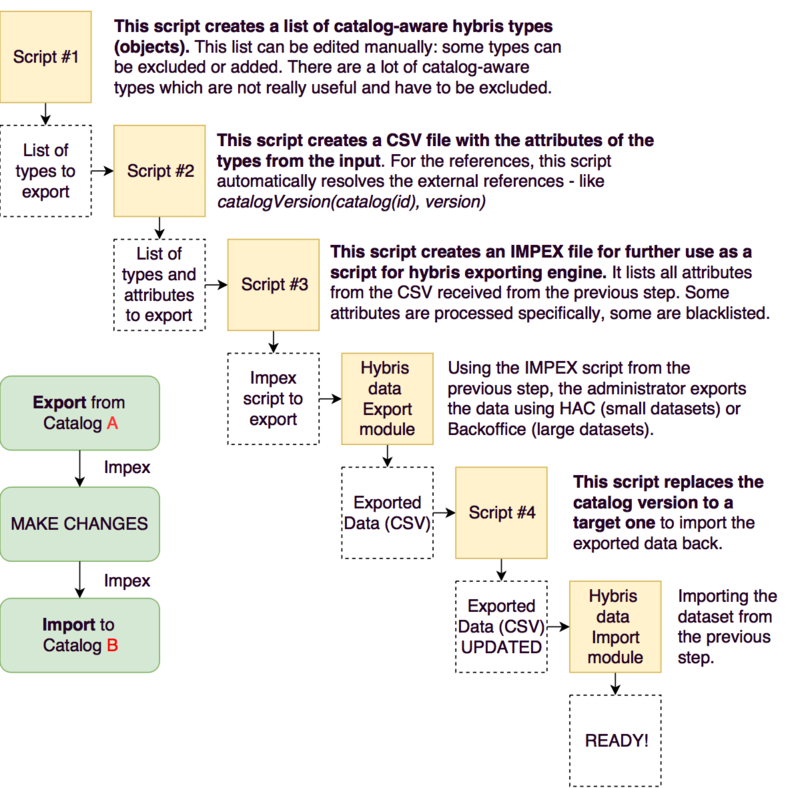 The output of the script can be used in the out-of-the-box exporting module. As you see, the new Product catalog is available here, the product is linked to the right supercategories, from the same catalog (apparel 2). Please take into account that these scripts are not designed as a complete and universal solution. It is just a proof of concept. Using these scripts as a starting point, I’ve developed the project-specific solutions for the needs of my project. Thank you Rauf. How about y2ysync? ← Useful Groovy Scripts. Part 5.